A jury on Friday cleared Aaron Hernandez of committing a double murder in 2012, handing the former New England Patriots star his first significant legal victory since his shocking arrest for a third slaying in 2013. 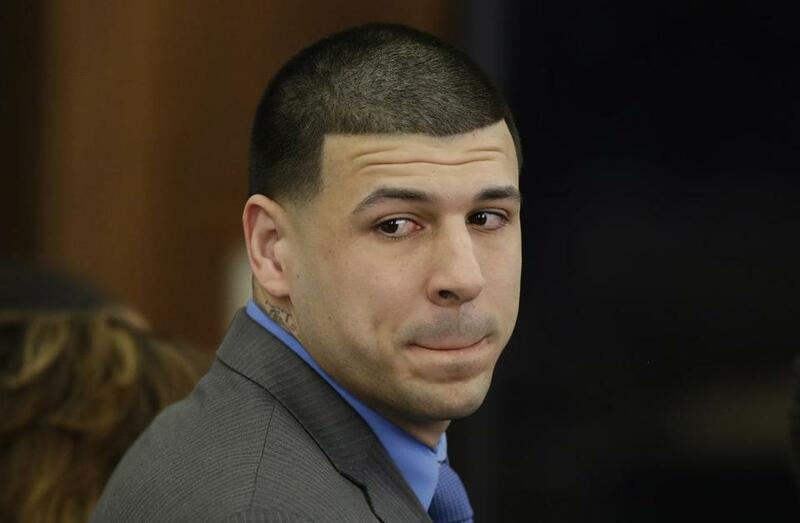 But by day’s end, Hernandez, whose career highlights included a Super Bowl touchdown and a $40 million contract, was returned to Souza-Baranowski Correctional Center in Shirley, where he is serving a life sentence without a chance of parole for his earlier conviction for fatally shooting Odin L. Lloyd in June 2013. His latest trial lasted a month, and the jury deliberated for six days. He nodded and choked back tears when the verdict came down Friday afternoon — not guilty on every charge except one, a gun-related crime. After rendering their verdict Friday, jurors declined to comment, except for a brief statement that foreperson Lindsey Stringer read. She said the jury “based our decision on the evidence presented and the law” but took no questions from reporters. Relatives of Daniel de Abreu and Safiro Furtado, the two men Hernandez was charged with killing in July 2012, sobbed when the acquittal came down in Suffolk Superior Court. Maria Teixeira, Furtado’s mother, struggled to keep her composure before the verdict was even announced and later left the courtroom in tears. Sullivan was referring to Alexander Bradley, the star prosecution witness, who testified under an immunity deal. Bradley told jurors he was driving Hernandez’s Toyota 4Runner when the athlete reached across him and fired five shots into the victims’ BMW in the early morning hours of July 16, 2012. The defense argued that Bradley, an admitted drug dealer currently jailed in Connecticut for shooting up a Hartford club in 2014, shot de Abreu and Furtado over a drug sale. District Attorney Daniel F. Conley bristled at what he said was the defense’s “inappropriate” portrayal of the victims, two immigrants who worked nights cleaning offices. Bradley’s testimony over three-plus days on the stand was often riveting. He portrayed Hernandez as a wildly impulsive athlete who, despite his fame and limitless potential, was prone to rages over minor slights, especially at the Boston clubs they frequented. One such instance occurred at Cure Lounge about two hours before the killings, Bradley said, when de Abreu bumped into Hernandez and spilled a drink on him. Rather than apologize, de Abreu smirked at Hernandez, touching off the deadly drive-by at the corner of Shawmut Avenue and Herald Street, according to Bradley. He said Hernandez became increasingly paranoid in the months after the killings, banning friends from using iPhones in his presence and constantly looking over his shoulder for undercover detectives. He even thought police were tracking him from the sky by helicopter. His paranoia reached a fever pitch early on Feb. 13, 2013, Bradley said, when Hernandez shot him in an SUV after a night of heavy partying in South Florida and left him for dead in a parking lot. The jury refused to credit that account as well, acquitting Hernandez of a witness intimidation charge stemming from the alleged Florida shooting. Hernandez was also cleared of firing at the three surviving victims in the South End drive-by, but was convicted of illegal gun possession. He was immediately sentenced to serve four to five years in prison on that charge. In a trial that saw more than 60 witnesses, the bulk of the case seemed to turn on Bradley, Hernandez’s former friend and drug supplier. Former New England Patriots tight end Aaron Hernandez turned to look in the direction of the jury as he reacted to his double murder acquittal on Friday. The prosecution’s key witness calmly told jurors he lost his right eye when a bullet from Hernandez’s gun struck him in the face. He has a prosthetic right eye and wore glasses during the trial, and occasionally glanced at Hernandez and shook his head, apparently still in disbelief over his former friend’s alleged actions. He highlighted Bradley’s correspondence with Hernandez after the Florida shooting, when he threatened to sue and kill the athlete, bragged about his personal weapons arsenal, and said he had “wolves” ready to assist him in committing acts of violence. But Bradley was generally unflappable during cross examination, repeatedly calling Hernandez’s attorney “Mr. Baez” in a sneering tone. Prosecutors also had strong moments, including First Assistant District Attorney Patrick Haggan’s impassioned, 90-minute closing argument. He reminded jurors that the “murder car,” Hernandez’s 4Runner, was found hidden in a Bristol, Conn., garage belonging to Tanya Singleton, Hernandez’s closest relative, nearly a year after the killings. He also said the murder weapon was recovered from a woman with links to Hernandez. And, Haggan urged jurors to remember that Hernandez got a tattoo in the spring of 2013 depicting a six-shot revolver cylinder with one empty chamber, as well as the phrase “God Forgives” on his right arm. “What is he asking God to forgive?” Haggan asked. Baez, Hernandez’s lawyer, said in a brief phone interview that the defense team was “shocked” when the jury put that question to Locke. At the same time, however, he thought at least two jurors were against a conviction, based on their body language and demeanor at trial. Legal analysts who watched the case said they were not surprised by the acquittal, because the case rested on Bradley, a convicted felon and Hernandez’s marijuana dealer, a difficult witness for jurors to find credible. Boston Police Commissioner William B. Evans said he respects the jury but disagrees with the verdicts. “The evidence in this case all points to Aaron Hernandez as the sole person responsible for the tragic and untimely deaths of Daniel de Abreu and Safiro Furtado,” Evans wrote in a statement. Conley, the district attorney, said the victims’ families are taking solace in the fact that Hernandez returned to prison after the verdict. Hernandez’s appeal hearing in connection with the earlier murder case is before the Supreme Judicial Court and has not yet been scheduled. The court could either uphold his conviction in the Lloyd case or order a new trial in Bristol Superior Court in Fall River. How could Aaron Hernandez throw it all away? Maria Cramer and John R. Ellement of the Globe staff contributed to this report. Travis Andersen can be reached at tandersen@globe.com. Follow him on Twitter @TAGlobe.